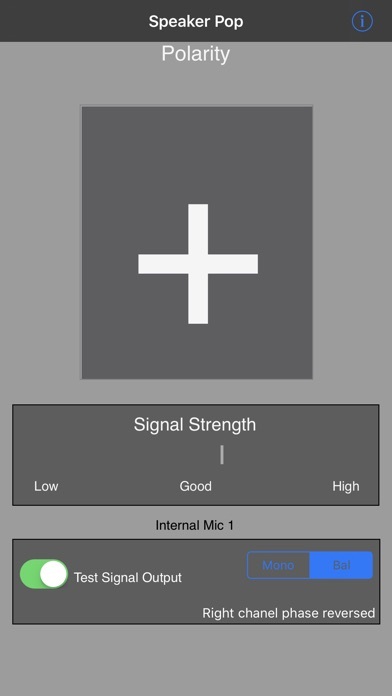 This app is a speaker polarity tester. Find out if your speakers are wired correctly (in phase or out of phase). Test your surround speakers, stereo speakers, PA speakers, in fact any speaker with wiring terminals on the back. This speaker polarity tester was designed by the same people who built the Audio Toolbox, and the polarity tester in that unit was known as the most accurate and reliable polarity tester available. Now that technology is available in your iPhone. Use this app to test your home speakers, recording studio monitors, or as part of your professional contractor work. Speakers wired backwards are the most common error in sound system setup, cause big problems, and are easily corrected. This app will give you the answers, no matter how difficult the wiring may be to trace. Speaker Pop works by watching for a proprietary "pop" sound from the speaker, and doing DSP analysis of the sound to determine if the speaker cone is moving in the correct direction. As long as you use a standard 1/8" stereo plug, you can use any normal 1/8" to RCA adapter to get the signal into your system. You can also to record the "pop" test signal to a CD, DVD, or another iPod, and play this signal through your speakers. Works with iAudioInterface and iTestMic. Select the speaker type filter, Woofer, Midrange, or Tweeter. This selects either a 125Hz, 500-2000Hz, or 8000Hz filter, to make the readings more reliable. Once you have the test signal coming out of the speaker, position your phone near the speaker (we suggest you flip it over to point the internal mic directly at the speaker the display will flip). In a few seconds you will get the reading on the screen, either a Plus or a Minus. Plus indicates correct speaker polarity, Minus means you need to swap the wires coming into the speaker. We also have stereo and surround test signals available for download from our web site which are ready for burning to CD or DVD. See our web site or for more information. Note that iDVD will not burn encoded surround files, a more advanced DVD burning authoring program is required. Some folks have had success with Toast. We also sell test DVDs on our web site. See our other audio apps: AudioTools, our premier audio and acoustics test and analysis app, SPL, the professional grade sound level meter for the iPhone, SPL Graph, for recording SPL over time, RTA, a 1/3 octave real time analyzer, FFT, for detailed acoustic analysis, ETC, the Energy Time Curve app, RT60, for automated octave-band decay time analysis, and Generator, the iPhone signal generator. Watch for more coming soon.